I had a very gassy tummy ache starting dinnertime yesterday. The pain was slight and dull but it was there nonetheless and I felt very bothered by it. I went to the toilet several times hoping to relieve some of the pain through passing motion but it was in vain. I still felt so uncomfortable. I dared not eat any medicine just in case it is not safe for pregnant woman. But I was feeling so uncomfortable that I asked mum for 'black hong eu' (wind ointment) to try to relieve some gas/wind. So I rubbed on a few drops of it on my tummy. Little did I realized that that was actually bad and unsafe for pregnancy when I told my gynae today. Gynae said most wind ointment contains methyl salicylate which is easily absorbed by the skin and can cause damage to baby's kidneys formation. But Dr. Eric assured me that I just used a few drops and it was an one-off event, so it probably didn't do much harm. But I learnt my lesson. Never simply take/use any medicines without doc's knowledge, not even rub-ons! 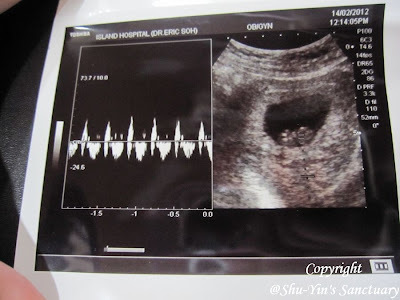 So I was quite nervous when doctor did an ultrasound on my baby. Not too sure if it was my baby that caused the stomach ache. 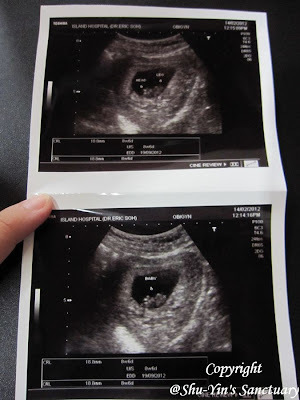 My eyes and ears were focused on the monitor, hoping to hear the sound of my lilttle bub's heartbeat. There it was......loud and clear. Phew. Doctor said that the stomach ache is not caused by my baby. But due to probably some food I've taken. I instantly remembered the tasty homemade nasi lemak cooked by my MIL yesterday. The coconut milk should be the culprit. Well, all's well ends well. Baby is good. And doctor prescribed me some Motilium pills, to relieve stomach bloating, fullness and reflux in adults. After taking it, I felt much better. But guess what? I lost weight again. Now 48.1kg, down another 0.4kg in just a week!